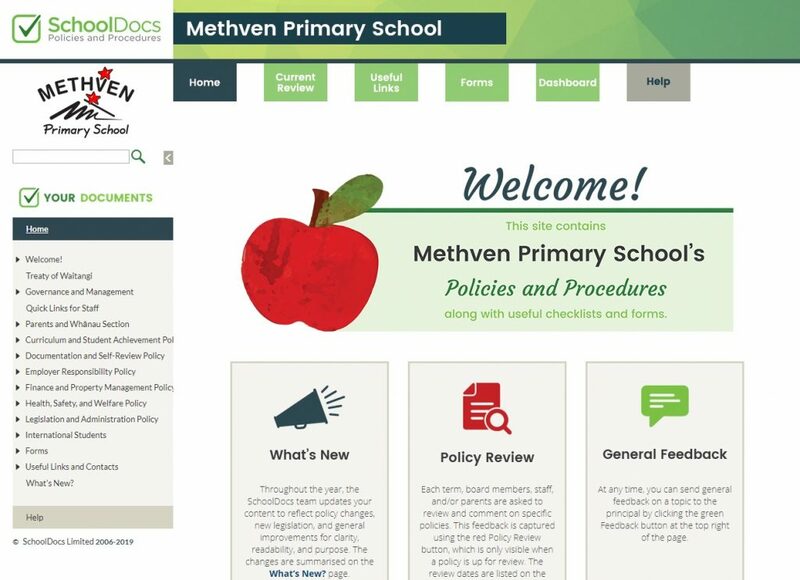 Methven Primary School uses SchoolDocs to manage our school’s policies and procedures online, in a way that allows us to maintain, review, and update them regularly. It ensures that our policies and procedures are up to date, that we’re following Ministry of Education best-practice guidelines, and that we’re meeting our reporting requirements. Our school has worked with SchoolDocs to create a website for our policies and procedures. SchoolDocs updates, modifies, or creates policies in response to changes in legislation or Ministry guidelines, significant events, reviews/requests from schools, and regular reviewing from the SchoolDocs team. Our board of trustees has the opportunity to view changes/additions and comment on them before they are implemented. We will advise you when policies are up for review and how you can take part in the review. © Except where stated, the content on this site is the copyright of SchoolDocs Ltd. It may not be reproduced without written permission from SchoolDocs Ltd.
JAB rugby practice has been cancelled except for U9 Black & U10 Black. Ph 302 8500 if students school pickup/bus arrangements need changed. Year 3 - 6 netball practise has been cancelled. Phone 302 8500 if students school pickup / bus arrangements need changed.